MigrationStudio is a project management portal which provides the project team with all the tools they require to plan, optimise and execute the migration. It uses a custom data warehouse to store information about the users, computers and applications for the migration, and facilitates easy, pain-free transformation projects. Understanding the current environment before getting involved in migration planning is key to success. MigrationStudio imports data from multiple sources such as Active Directory and Microsoft Config Manager (SCCM). This produces an "as is" model of the environment with full context around users, their location and department, the machines they use, the applications they use, and the status of those applications. Which applications are in use by the Finance team in New York? What are the most used applications across the organisation? 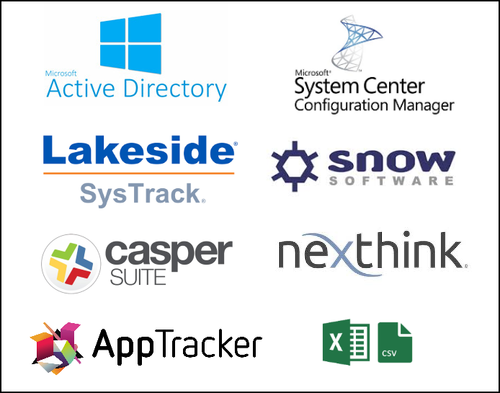 Connectors are available for Active Directory, ConfigManager (SCCM), Lakeside SysTrack, Snow Licence Manager, Nexthink. AppTracker integrates with MigrationStudio. Excel/CSV import are fully supported. More info on the connectors. Once the initial data harvest is complete MigrationStudio’s dashboard provides a high-level view of the estate. This is highly customisable, and provides the ability to drill-down into the data. The dashboard layouts can be templated and assigned to sepcific users. Anyone who needs access to just the Dashboard can subscribe to daily email updates. It's common for an organisation’s application estate to get out of control. Multiple versions of the same product may be in use, and products which have become redundant for the organisation may be remain under management by IT. These situations are an unnecessary source of cost and effort. Each application contains a list of users who have used that application (based on data from software inventory), where those users are located, and which department they belong to (based on data from Active Directory or an HR system). Once decisions have been made around whether to reject/accept/rationalise the application it's a simple right-click option. Auto-reject applications which, based on our extensive experience on migration projects, are not important for the migration. We typically find that 10-20% of the discovered applications can be rejected. Auto-normalise the application name/vendor/version (where required) to present a consistent naming standard. This is very useful where SCCM is the source of application inventory. The embedded video shows more detail on how application rationalise decisions are managed in the solution. Now that the in-scope applications for the migration have been defined, it's time for the Applications Project Manager to start planning the applications work-stream. It's typical for 100's of applications to be in scope for a project, and this can take the applications team many months to complete. If we use a "waterfall" project management approach we would look to wait until all (or most) of the applications were ready before we begin our pilot migration. This is necessary to ensure that all the users in the pilot migration have all the applications they require to do their jobs. With our solution there is a better way. Our "AAP" report (AppTracker Application Prioritisation) enables us to use an "agile" project management approach and break the application estate into smaller tranches (or "sprints") and begin the migration much earlier than would otherwise be possible. AppTracker suggests which applications to focus on each week, and shows which users can be migrated when that tranche of applications is complete. This enables the project team to begin migrating users just a few weeks into the applications effort, rather than having to wait months for all the applications to be ready. We've found that this typically enables 80% of the users to be migrated with just 20% of the applications complete. This can shorten a 5,000 seat migration project by three months. Further details on AppTracker here. As the applications are being prepared for the new environment it's important that the project team have real-time updates on this work-stream, and can view how this impacts the "readiness to migrate" across the organisation. Who is ready to be migrated in the New York office? Which applications are outstanding for the Marketing department in Paris? What's the bottleneck holding up the migration of the Asian offices? In addition MigrationStudio provides "what-if" analysis where various scenarios can be evaluated. This allows you to model different migration strategies to understand the best-possible approach. Before we can start to schedule users for migration we need to ensure that the user-base are fully informed of the migration plans. MigrationStudio's templated HTML emails allow communications to be sent out quickly and easily to departments, locations, or custom groups of users. It's typical to spend effort on collecting data about users during the lead up to the deployment phase. MigrationStudio allows the project team to send out customisable User Surveys, allowing the users to validate this data before they are migrated. This significantly increases the chances of success, and improves user satisfaction. The User Survey would typically include contact details, user location, department and an application list. The user can sign-off the survey if the data is correct, or raise a query if there are issues. Once the surveys are complete a plan can be put together around when users/departments/offices will be migrated during the deployment phase. Deployment Units are used to group the users broadly into migration "tranches", then the users can be sent self-scheduling links allowing them to choose migration slots which fit in around their schedule. MigrationStudio's API allows third-party systems to be controlled (deployment tools for example) so that the migration can optionally be fully-automated if required. Once users have been migrated they can be sent Satisfaction Surveys so that feedback can be collected on the end-user experience. The completes the overview on how MigrationStudio and AppTracker make migrations faster, easier and more cost effective.